Our approach to homework in Key Stage 2 is designed to help develop rounded individuals who will enjoy a happy and successful adult life. 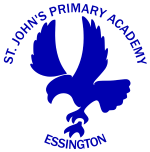 The approach will focus upon encouraging children at St John’s to attain a Personal Development Award which will recognise their effort outside of normal school time. The PDA focuses on a set level of expectations for each pupil over the academic year. At the end of the school year children will be assessed against the expectations and a Gold, Silver or Bronze award will be given dependent upon how much of the criteria they have met. All levels will be recognised with an enamel pin badge that children attach to their uniform. Have evidence of regular reading at home in their reading diary. Make significant progress in their spelling and times tables assessments. Only a small number of gold awards will be given out at the discretion of the class teacher to the children who fulfill all of the expectations.